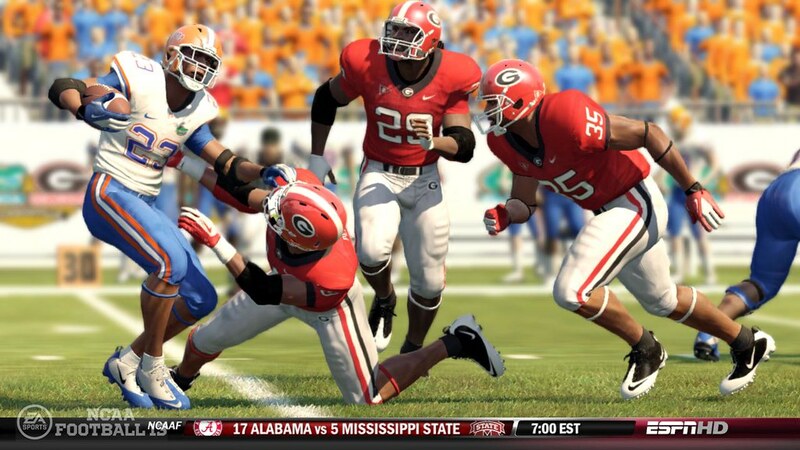 The NCAA Football 13 Dynasty Mode Improvements have been revealed. Continue on to read the official blogs, view the Dynasty Mode trailer video, see the full list of improvements, and more. Game days come to life with mid-game updates featuring a new studio analyst, plus enhanced commentary from NCAA Football veterans Kirk Herbstreit and Brad Nessler. Recruiting now goes deeper than ever with the addition of dynamic grades and the ability to scout players. Plus, there are even more ways to interact with your Dynasty from the web. Breaking into Top Ten - If other schools do not show interest, team can move onto board. Prospects start with fewer teams on board. Any team has a chance at every recruit. Changes to Player Transfers - New reasons for leaving: Playing Time, Broken Promises, Coach Leaving, Homesick. Try and keep players from leaving by offering recruits. Broken promises can hurt Coach Prestige. Improved transfer logic and number of transfers. ESPN Studio Updates: Live updates in all four quarters, updates will show one to four games. Will highlight: General & Top 25, Upset alerts, BCS updates, big days for players. Hosted by ESPN's Rece Davis. New game open will feature "live look-in" from Rece in-studio and then sending it out to Kirk and Brad. Yep, the wait to leave work, from 2 pm to ~6 pm, is going to be excruciating. pfff. i dont get home til 7 pm pst. and i dont have a phone that can access the internet. can someone just tell me today? Well, the only reason it's excruciating for me is because I have enough access that I can see the headlines posted by Pasta, TGT, etc, but I can't actually read the articles until I get home. If I couldn't see anything, it'd be much easier to be oblivious. Until the articles start going up around 2, I'll probably completely forget. We officially begin spring football tomorrow at my high school so I'll be home later then usual. I probably won't watch the webcast after the fact but if there's a sizzle video, I'll be content with that and reading comments/impressions. Same here! Wont get back home until around 7ish because of track practice! Making it even worse is that I have internet and web access but our district web access does not include anything from EA or messageboards like this! All I get is a restricted access error message! Ugggh!!! My phone has wifi, but automatically connects to the district internet while on the campus! Either way, I am screwed UNTIL I leave the building and or surrounding HS campus area! My web access is extremely limited at work. Sometimes I e-mail my brother who does have access to e-mail me sites and info at work lol. Will today be the day we find out about in-game saves? I've already prepared myself to be disappointed. In-game saves would be the #1 dynasty addition for me. Nothing else would top that. Now off to play the Show and use the in-game save feature if my kids wake up early. Can someone provide a link to the webcast? Thank you! CD guys, do you know all the stuff that's going to be announced or will there be surprises for y'all as well? Pretty well know all of the stuff. Might be a thing or two that some of us missed or something but they certainly didn't hold anything back intentionally. I just got out of class early today. Well, dynasty features along with game play are huge deals for me. I am optimistic about what's in store for us today. Looking forward to some great info on recruiting and scouting. Looking forward to some (hopeful) big announcements. Scouting unlocks the actual numbers and overalls of players as you recruit them. Nice, they actually tell you what you specifically have to do to improve your recruiting grades in dynamic grades. Playing Time has changed somewhat. Proximity to home has also changed, if the player is in the city where your team is (Tuscaloosa for Alabama), it's an automatic A+. It looks like just about every recruiting pitch has changed to varying degrees (some new areas that affect the grade, changes in how the grade is calculated, etc), but they have also changed it where everything is shown as to exactly what you have to do and have to try to do to improve your grade in each pitch, so there's no longer any uncertainty about what you have to do to actually change a pitch grade. I would add to that: These pitches are now just based on more realistic measures. Your school's ratings should make sense now.